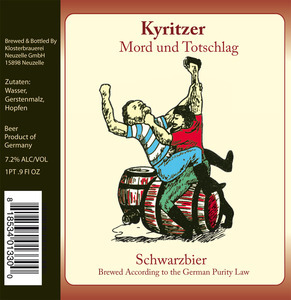 Klosterbrauerei Neuzeller Mord Und Totschlag is imported by Shelton Brothers, Inc. in Belchertown, Massachusetts from Germany. The alcohol content is 7.2%. This brew is poured from a bottle or can. We first spotted this label on May 14, 2013.